Shock makes you look at everything with fresh eyes, without even trying. 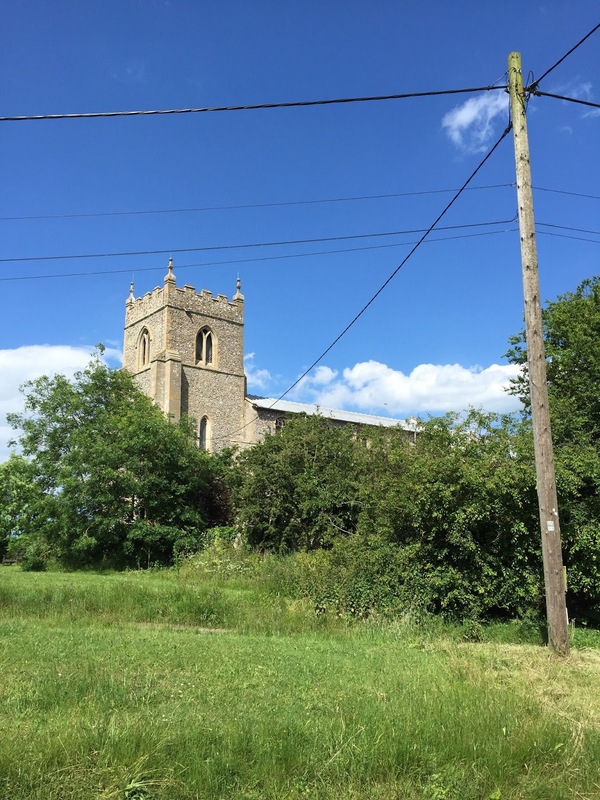 In the days after the referendum I fell in love anew with the churches in my vicinity in North Norfolk. What is more comforting than beholding a building that has survived upheaval, war and changing fortunes over many centuries? That has been maintained, repaired and cherished by generation after generation, doubtless many of whom didn’t always get along. It puts things in perspective. It was built in by Mungo Buxton, a brilliant man who had been in the RAF during WW2, was an inventor - a creator of boats and planes, an independent and bold investor on the stock exchange, a man with many and various interests including tree husbandry. He and his wife Horatia (Racy) Buxton, had lived in the Old Rectory next door. Famously Mungo had once built a boat in the drawing room and the window had to be dismantled to get it out. He and Racy bought the plot of land that had once been the approach to the Rectory as well as its vegetable garden, and applied for permission to build a bungalow. From the outside it is nondescript, even rather ugly - red brick with a steep pitched roof and blank window-eyes. However, it is inside that the magic happens. We will go there in a minute, but first, a word about its setting. 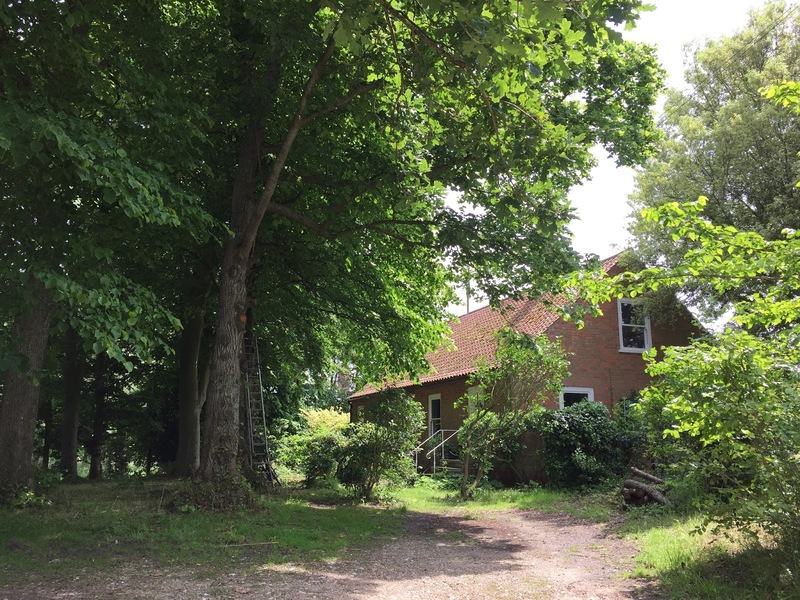 The house is set among the trees that once led to the Rectory- now tall majestic beeches and limes with wide canopies casting an under-water light into the kitchen. Behind the house is an orchard: plum, apple, pear and quince and behind them some unkempt alice-in-wonderland box hedges like frozen waves. 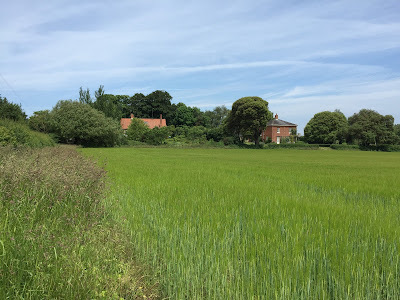 The present tenant has done some trimming to open the view up to the soft emerald unripe barley field beyond - swaying and verdant, the wind rippling and whispering through it. Mungo applied for planning permission to build a single storey house. He gave it an enormous attic, thus the pitched roof, accessible only by an external staircase - a victorian wrought iron spiral stair, salvaged from Watts´ Naval School outside Dereham, where, Mungo's daughter Rose tells me, it had been used as a pulpit when the gym doubled as church on sundays. The children, who slept in the attic, had to brave the elements, wind or shine, when going to and from their bedrooms. Rose doesn't think that this was to get around planning regs, but it certainly made life simpler. Glass roof tiles let light into the attic, and then on down to the ground floor, through a large thick glass section of the attic floor. The design throughout it in the same spirit: functional, stylish and ingenious. Perhaps because much of it is clearly inspired by ship design, you feel like you are in a different kind of vessel from an ordinary house - the proportions are efficient and the storage neat. Mungo suffered from arthritis, so he preferred storage low down, below the floor boards, as it was easier for him to access than high up. 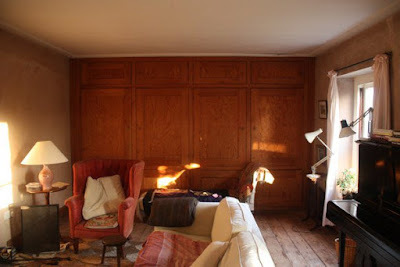 Thus, in the sitting room there is storage for wood next to the fireplace. 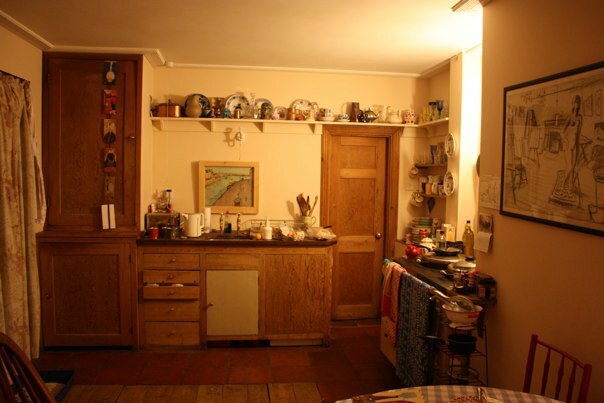 And in the kitchen there is floor storage for (I imagine) wine and jam. There is an unusually narrow doorway leading from the kitchen into the hallway. Tall and elegant - like Mungo and Racy. There is a hidden door in the sitting room, disguised as panelling; rather than paint or wallpaper, there is exposed plaster work throughout, now slightly grubby, that was daring at the time, and still has a warm patina. 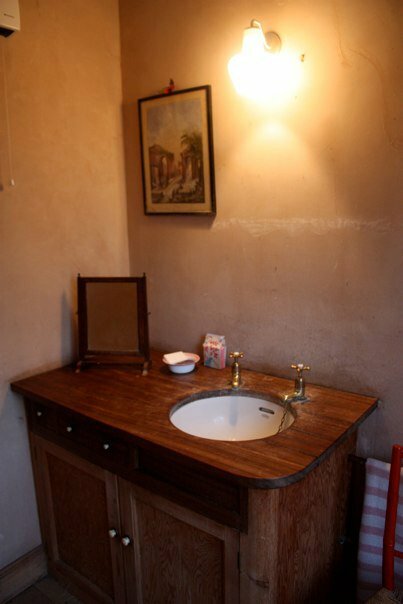 The guest bathroom has wooden surfaces that create a rich, warm interior even in the winter. Its simplicity is given an extra lift by a touches of brass and ceramic in the taps and door and cupboard handles. Rose says: "Dad was inspired by many sources in designing the house: the golden proportion, that underfloor storage and the nifty brass rings to lift the lids are from ships: I once found a drawing of graduated drawers (for an office) by his friend Kit Nicholson and realised that the drawers in the kitchen probably copied them: and when I went round the Sir John Soane museum I saw a little washbasin in a library with the same round bowl and rounded wooden top." The master bedroom lets out on to what I like to think of as the summer bathroom - way too cold to enter in the winter - but in the summer - lie back in the bath, the door open and lilacs blooming all around and you are floating on a happy cloud. 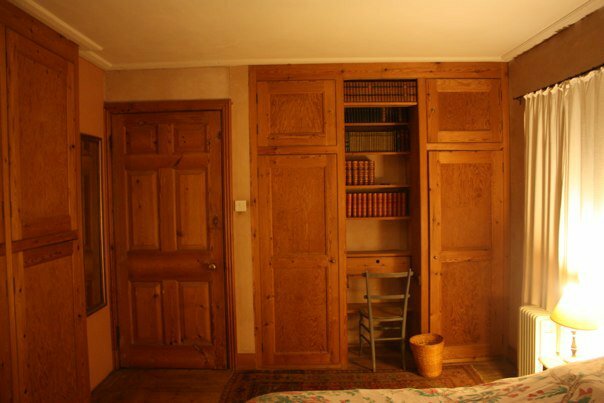 Without doubt the tour du force is the study, which you enter through the master bedroom - down a short flight of angled steps. This has a large window and a glass door opening directly into the garden. A handsome dutch wood burner keeps the room warm. 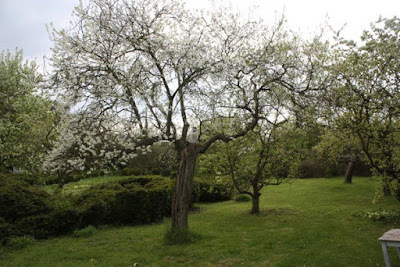 Many was the day that I would spend at the desk, gazing out sideways at the plum tree, the surreal box hedges and fields beyond - watching the sun set, feeling the warmth of the stove, Malinka curled up beside or under it. 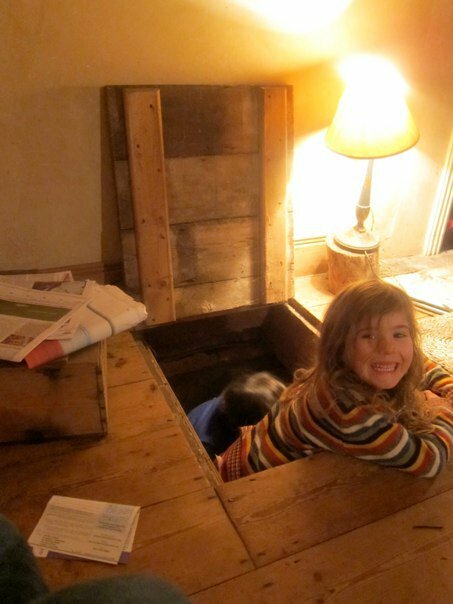 the steps down to the magical study. 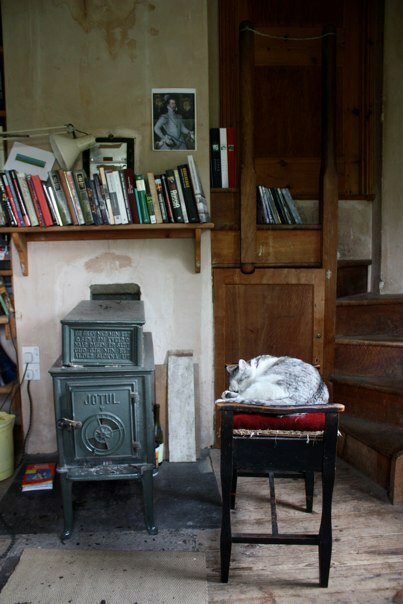 Malinka asleep by the Dutch stove. Because it is on another level, the very action of entering this room, taking the few steps down, takes you into another headspace. This was Mungo’s desk and is a place of concentration where ideas are considered and given form. But hell, who cares if precisely nothing happens in that room - the point is, it is simply a wonderful pleasure to be in. I worked on lots of articles and essays there, and did lots of research for a book that got more and more ambitious and was never written. But I do not begrudge a single moment - it is one of the best rooms I have ever had the good fortune to have the keys to, and I thank Mungo heartily for creating it. I moved to the house for 2 years after a difficult 9 months during which lots of major life events that were set to happen, didn’t happen. 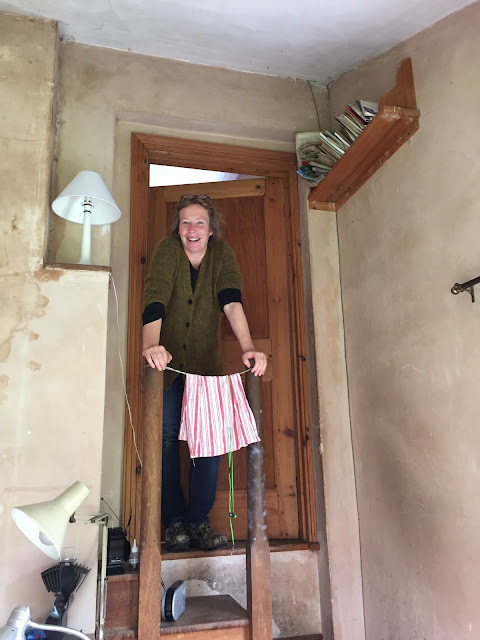 I crawled into the house fairly devastated, and its peace held and healed me over two years and was a haven from expeditions to London and Moscow. After two years I decided to move to Golden Lane - a more urban spot you could barely find - and gave up tenancy of this wonderful house in the woods, 2 miles from the sea. As I packed my bags, I received a message from a cousin who had a friend who was looking for a house to write a book about his recent kidnapping and release by the Taliban. For the following four and a half years this survivor became still enough to realise he had PTSD and like me, fail to write a book. He evaporated as quickly as he appeared, again leaving the house empty. The owner had given up on finding someone, when through a chance encounter in the village, the present owner was found, in need of a home in the UK after a family break up in France. 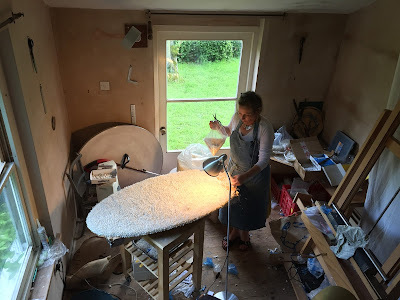 The super talented artist Blott Kerr-Wilson is now in residence - creating shell wonders in the living room and the study - benefiting, I trust, from the magic of the house, and feeding it too. Well done Mungo and Racy, and all who have lived there. A healing house with a beautiful story...this was a lovely read. Encourages one to look at the places one inhabits more intentionally - conceived, built, lived in by so many lives.